**This is a sponsored post written on behalf of Grace Hill Media. All thoughts are 100% my own. When I think of summertime, I cannot help but think of adventure. They go hand in hand, don't they? As I prepare to try to make an adventure filled summer for my own children, I started reflecting about my own childhood adventures. My favorite adventures? They weren't the ones that were most exciting in the eyes of many. It wasn't the vacations or day trips to fun parks. No, my favorite adventures were a little more creative. They were the moments where I drifted to far off lands, not by car but by my imagination. We weren't wealthy growing up by any means, so fancy vacations weren't really in our summer plans. Growing up in the country, we didn't have a lot of excitement around, our imaginations were all we would have. But...we utilized them! The creek where we spent so many summer days may have looked like an old country creek to many, but for us it was a deserted island where our ship had crashed. It was an ocean. It was the river from Pocahontas. It was our own personal paradise. Those old gravel roads and a couple of bicycles might not look like much, but we could go wherever we wanted and be whoever we desired. Sometimes we were Power Rangers saving the day, other times we were in a big city taking in the sights. It wasn't the money put into our adventures that made them great. It wasn't the exciting destination. It was that we enjoyed the time together- as sisters, as cousins, as friends... and aren't those the best kinds of adventures? The ones spent with the people you care about? BEYOND THE SUN will be available for purchase across multiple platforms including iTunes, Amazon, and TUGG Today, May 15th. What were some of your favorite childhood adventures? Who did you share them with? Are you looking forward to this beautiful movie and sharing their adventure with your family? This sounds like a great family movie! Holy cow...a visit with the Pope! The movie looks interesting too. I am looking forward to seeing this movie! Faith is important in my family. This looks like an interesting documentary. Faith is something everyone in my family is striving for. I am very interested in watching this movie. This sounds like a good, family friendly movie! 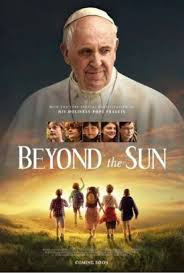 I think its neat that the pope appears in it! Sounds like a great family movie.